I like minis. For example: my skirt could probably be considered a mini today, since it’s a shortie and my Elliot is just a little guy (14 lbs) and I order big beers at sushi restaurants because they are served in mini glasses and I always opt for mini burgers over full-size. These cupcakes just reinforce the mini-love. What do you like best? Regular-sized cupcakes or the perfect 2-biter? I also really like cookie dough … but who doesn’t? Remember these truffles? And that story about eating cookie dough since I was a teensy baby? 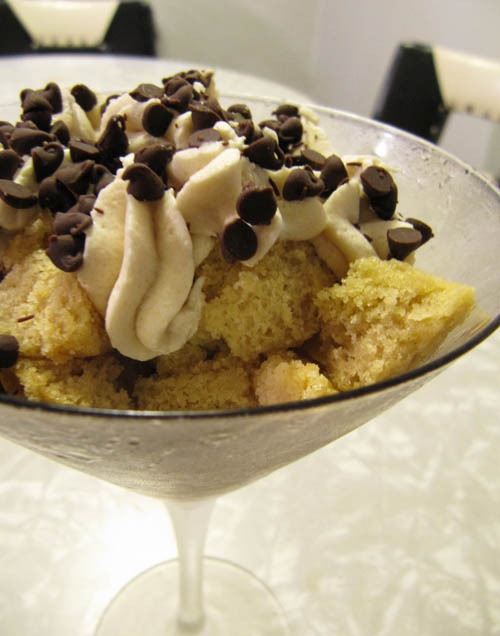 Well, this recipe is just another reason for me to get cookie dough out of your dreams and into your belly. And isn’t it true that there can’t be too much of a good thing? 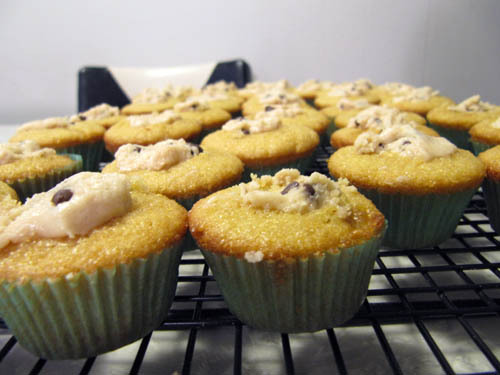 That is why these little brown sugar cupcakes have cookie dough filling + frosting. Make cupcakes. Preheat oven to 350ºF. Line mini cupcake tins with liners. In a large bowl, using an electric mixer, beat the butter and brown sugar together. Beat together on medium-high speed until light and fluffy, about 3 minutes. Mix in eggs one at a time, beating well after each addition and scraping down the sides of the bowl as needed. Combine the flour, baking powder, baking soda and salt in a medium bowl. Stir together to blend. Add dry ingredients to the mixer bowl on low speed, alternating with the milk, beginning and ending with the dry ingredients, mixing each addition just until incorporated. Blend in the vanilla. Make cookie dough filling. Combine the butter and sugar in a mixing bowl and cream on medium-high speed until light and fluffy. Beat in the flour, condensed milk and vanilla until incorporated and smooth. Stir in the chocolate chips. Cover with plastic wrap and refrigerate until the mixture firms up a bit. 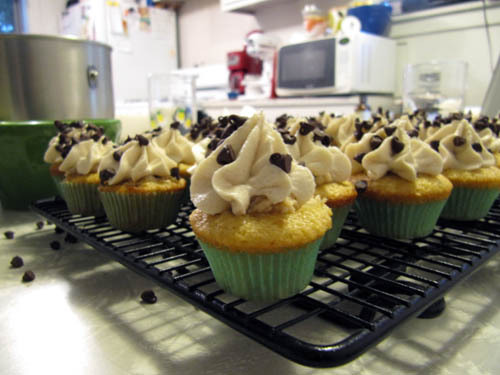 Fill cupcakes. 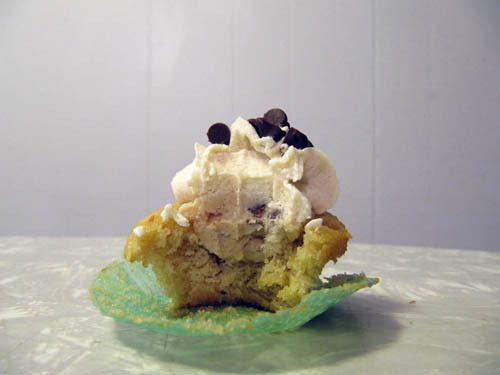 Cut a small cone-shaped portion out of the center of each cupcake. Fill each hole with a chunk of the cookie dough mixture. Make frosting. Beat together the butter and brown sugar with an electric mixer until creamy. Mix in confectioners’ sugar until smooth. Beat in the flour and salt. Mix in the milk and vanilla until smooth and well blended. 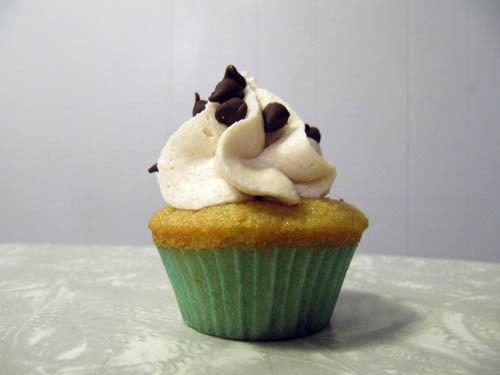 Frost the cupcakes generously, sprinkling with mini chocolate chips. I made Jake a trifle with the middle bits, leftover frosting and table chips. Megan these look amazing… I think I’m gonna make these for my friend’s shower! I love these. Wish we could hang out and bake! Thanks Zoe. Man, it’d sure be fun to bake together.